The first formula: * powers, * / factorials, + - (large) numbers . an easier, faster, iterative way. 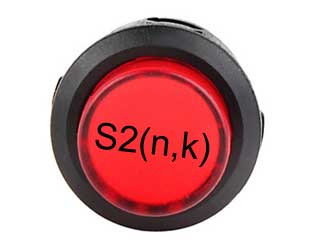 if (k <= 2) return k == 0 ? 0 : k == 1 ? //        - k close to n , go from right to left in table ? //        - same/similar trick for: - other sequences ? //                                  - sequences using S2(n,k) ?